Reading the essays in A SECOND BLOOMING I was immediately reminded of Winston Churchill’s memorable appeal to the British people in 1941 in the darkest days of the German Blitzkrieg: “Never, never, never give up.” Susan Cushman’s anthology brings that message home to all readers, women and men, in a collection of powerful, lyrical, unforgettable prose. 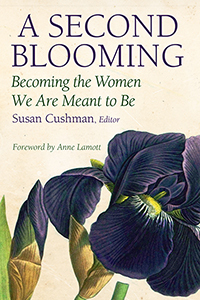 You will find yourself somewhere in Susan Cushman’s A SECOND BLOOMING. I discovered pieces of me within these testimonies. The women in this book don’t preach. There are no sermons. Turning their adversities into advantages, each one has lived to testify to the severe depths at which they traveled to get where they are. It’s not an overstatement to say I loved this book. I didn’t find instruction or admonishment but I did find a greater sense of comfort, familiarity, and empowerment. And God. He’s present in every chapter. These inspirational stories breathe frost and fire, offering hope and second chances. Beautifully written and heartrending, A Second Blooming is a must read! A SECOND BLOOMING reads like an urgent prayer. Inside, courageous women writers relate painfully honest stories sure to inspire not only survival but thrive-al. Filled with heartbreaking transitions from past selves to new, it’s a must read for any woman tattered by life and circumstances, eager to rise from the ashes again.